Usually desserts are not part of your daily diet, nor should they. They are supposed to be the crowning piece of a well curated feast rather than a cheap sugary thrill – at least in theory. In reality, even the most steadfast of us succumb to sugar’s siren call every now and then. This is nothing to be ashamed of. Everyone needs the occasional sugar rush to push through the remaining hours of the day, am I right?! The following desserts take only 20 minutes on average to prepare, which makes them perfect for battling a sudden drop in blood sugar. For good measure, we have thrown in some fruit as well – to soothe your sweet tooth AND your guilty conscience. In short, the main ingredients of this recipe are just pear, pastry and brown sugar. If you're not into pears, you can easily swap them with apples, strawberries or any kind of other fruits. It's that easy. It’s soft and tender and melts right away the moment you put it in your mouth. 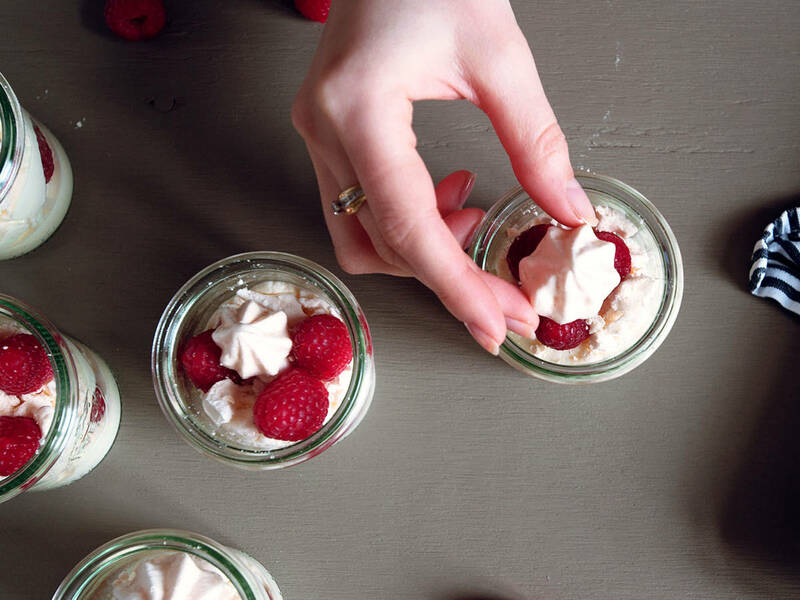 The fresh raspberries lend it a refreshing flavor, making it a perfect springtime dessert. At first it’s just the subtle coconut aroma you will notice. But once you sink in your teeth you’ll experience a truly mesmerizing combo of sour pineapple, luscious meringue and white chocolate. The more you eat, the harder it will be to stop.